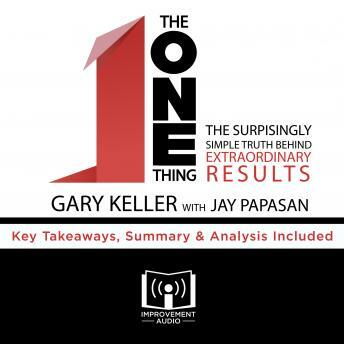 Listen to "The ONE Thing by Gary Keller" on your iOS and Android device. Learn how you can apply the main lessons & principles from The One Thing in a quick, easy listen! What is the ONE thing that is most imperative for your success? What is the ONE thing keeping you from reaching your life? In a world where more is better, we are drowning in choices. We are taught from the time we are little that it is okay to multitask. Our life becomes too busy. We get too lost in what's going on. It all comes down to choosing how to find that ONE thing that really and truly matters. That is the point of this book. You are going to find that this book teaches you which questions to ask. It shows you what you want to do and what not to do. The most surprising thing about learning the ONE thing important to you is learning how to let go of all that is holding you back.